Delighted to have been shortlisted for a third time for the Association of Illustrators prize for Illustration. This years shortlisted entries will be on display at the London Transport museum from 8th February to 14th July. My piece is entitled Rave on the Underground and illustrates an illegal rave held on the Bakerloo line in 2017. Visit The Private Press to find out more. I'm pleased to say that I am now represented by Artist Partners for illustration work. Please contact christine@artistpartners.com with with any enquiries. Talk at the House of Illustration. Publisher Design for Today and myself will be giving a talk at the House of Illustration, Granary Square, Kings Cross, on Sunday 25th September at 2.30pm. We will be discussing the 3 Storeys book and the Design For Today imprint. Entrance to the talk is free with a ticket to the gallery, and we will be holding a book signing session in the gallery shop afterwards. I was thrilled to have been asked by Modus Furniture to take part in the Who's Casper project alongside 15 designers including Tom Dixon, Sir Kenneth Grange, Anthony Burrill and Chrissie Macdonald. Each creative has customised a Casper stool designed by Michael Sodeau. The results will be exhibited at Designjunction as part of the London design festival. They will be auctioned off in support of refuge charity Movement on the ground. So you have the chance to get your hands on a truly unique piece. To celebrate the launch of the 3 Storeys book Unlimited in Brighton are hosting an event to present the book and new architectural prints. Publisher Design for Today will also be there with a selection of publications. The event will be held on Thursday 22nd September, from 6-8pm. If you would like to attend the event please RSVP to hello@unlimitedshop.co.uk as space will be limited. More details can be found on the Unlimited website. I will be at the Twentieth Century graphic arts fair 'Bouncing off the wall', with publisher Design for Today, on Sunday the 18th of September from 12pm signing copies of 3 Storeys. The fair is being held at the Erno Goldfinger designed Greenside school, Westville Rd, Shepherd's Bush, London, W12 9PT. Goldfinger was a big influence on the book and the school was an inspiration for one of the illustrations. The school also houses a mural designed by Gordon Cullen, so well worth a visit. It is part of the Open House London event and there will be exhibitors and talks on a range of Mid century design. For a number of reasons I've decided to close my Etsy store. I'm still making and selling prints and other things. So if you see something you are interested in do contact me. 3 Storeys has been litho printed using 4 spot colours. These images show the book being printed and checked. The book will be launched at the 20th Century Graphic Arts fair at the Erno Goldfinger designed Greenside school in London 18th September 2016. Pink Week is a week of events aimed at raising money and awareness for Breast Cancer care. Founded in memory of Dina Rabinovitch. 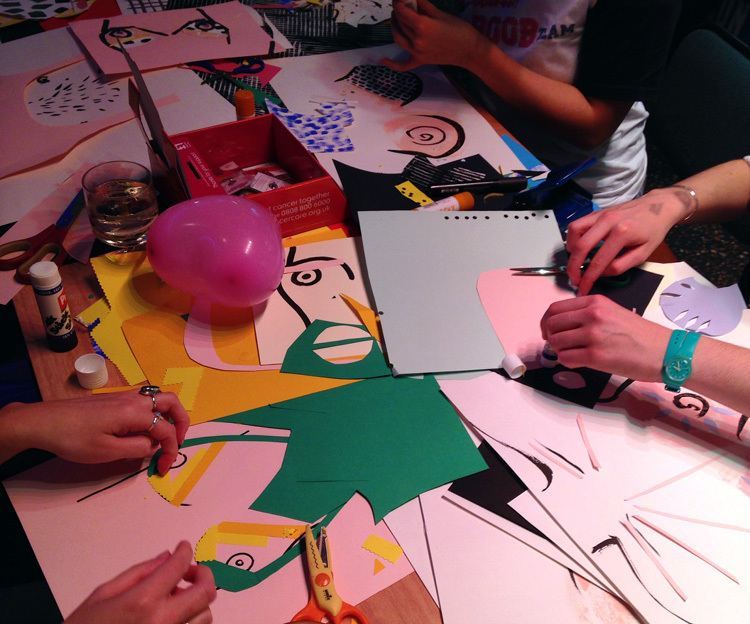 I was invited to run a workshop for a creative day event held at Patterns in Brighton. 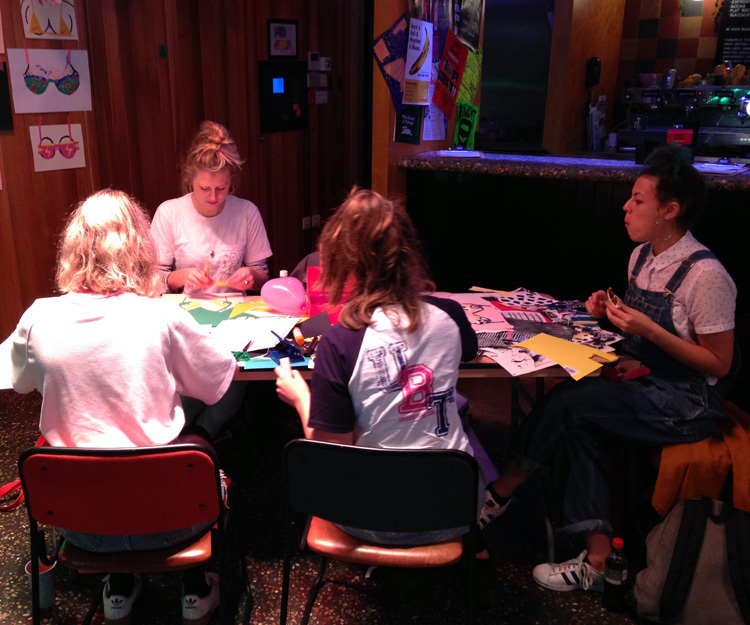 I worked with illustrator Lucy Sherston, offering visitors the opportunity to collage their own bra. Here are some of the results. I was interviewed by computer arts magazine for their November 2015 issue, sharing tips on how to stay motivated and productive as a freelance designer. South Korean lifestyle magazine Weekender Man interviewed me and made a little film about me. You can see the results here. They have some great interviews on the site. Worth checking out. My shortlisted entry for the Association of Iluustrators prize for illustration is now exhibiting as part of the London Places and Spaces exhibition at London transport museum. 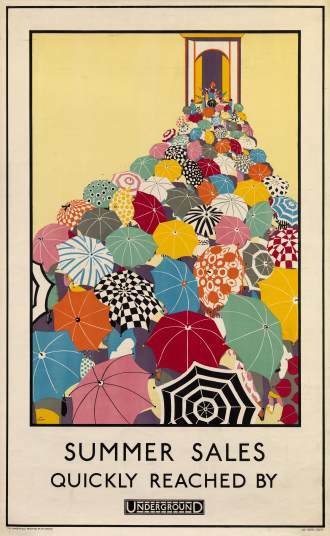 You can also purchase a poster print from the London transport museum shop. I have a limited run of A2 giclee art prints of 'Beneath' available, so please contact me if you are interested. Four Play exhibition comes to Brighton for the Arts festival. You can find the collaborative project I took part in at the Unlimited gallery on 10 Church Steet, Brighton, for the whole of May. Well worth a visit! You can find out more about the project on the Unlimited website and via their instagram feed @unlimited_fourplay. Here is the image I created in collaboration with Patrick Morrissey of Unlimited design. Prints are available to purchase and can be found at the website. Mini print packs containing all 40 images created by each artist involved can also be bought. Illustrator Jamin Galea is curating a great project as tribute to brand guru Wally Olins. He has invited illustrators to create portraits of Wally, which you can see at Wallofwally.com Hopefully it will become an exhibition later in the year. I've been involved with a great project for a while now, and it's exciting to see it start to come to fruition. I'll be able to share more soon. 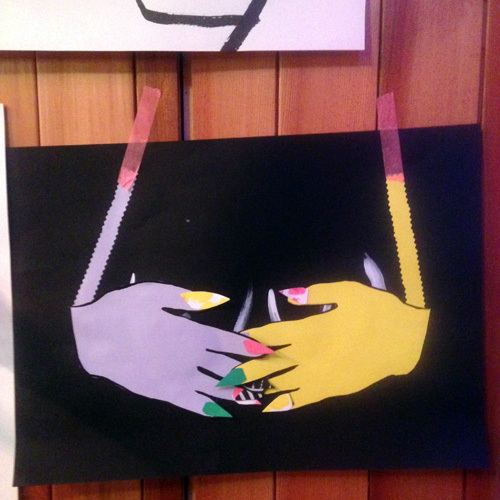 Four Play is Forty artists each contributing an image based on a Four letter word, all using the same Four colours. It is a collaboration with Unlimited design studio, who will be giving each image a Four letter type treatment. The show will launch at Boxpark in Shoreditch on 20th April. More details soon. In the meantime here is a peek at some of my design.